Luces y sonido de Navidad Santo Domingo / Lights and Sounds of Christmas Santo Domingo. The big Año Nuevo / New Years Eve Concert, Party and Celebration! Starting at 9PM on Avenida Francisco Alberto Caamaño Deñó (Avenada del Puerto – Paseo Padre Billini) at the Puerta la Atarazana. The Gate of Las Atarazana is so beautiful at night in the Colonial Zone and it will be the perfect place to bring in the new year brought to us by Valenzuela Productions and it is FREE! 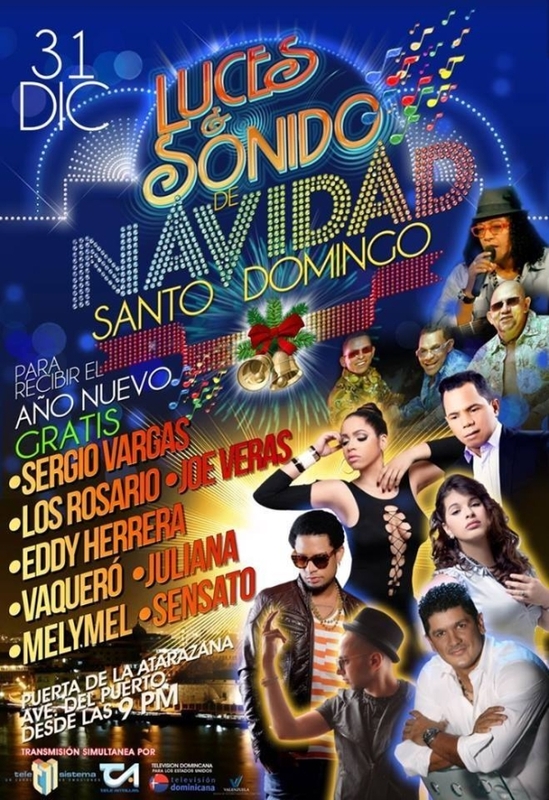 This big concert will bring Los Hermanos Rosario, Sergio Vargas, Juliana, La Chiquito Team Band, Joe Veras, Vakeró, Mozart La Para, Melymel, Sensato and other surprises to end 2013 and bring in 2014. There will be a great stage production, awesome lighting and effects, great sound, fireworks and more, more and more. If you do not feel like going out you can also watch the concert from home broadcast live on television channels Telesistema11 and Telentillas and for you people in USA that want to watch it will be on Televisión Dominicana, from 10PM December 31 to 6AM 2014. (Click the links to watch on line). Learn Spanish Today Fast and easy. Events 2013-2014, 2014, ano nuevo, atarazana, celebration, concert, fire works, new years eve, plaza espana. permalink.